“How many licks does it take to get to the Tootsie Roll center of a Tootsie Pop?” This was the catch phrase for Tootsie Pop commercials in the seventies. An animated boy asks this question to a turtle who sends the boy to the owl because he is much wiser. When asked, the owl begins licking and counting. After only three licks, he bites into the lollipop which greatly annoys the boy. 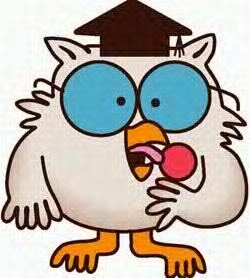 The narrator of the commercial then announces that “the world may never know” how many licks it takes to get to the center of the Tootsie Pop. There have been studies attempting to answer this decades old question with results ranging from hundreds to thousands of licks. I know there were many kids, like me, who ate Tootsie Pops and tried unsuccessfully to get to the center without biting. We took our time counting each lick, but finally just couldn’t stand it any longer, bit into the Tootsie Pop, and it was all over. Many of us wonder just how many times God expects us to forgive those who sin against us. We often treat forgiveness like a Tootsie Pop. Just as we count the number of licks to get to the center, we tally the offenses against us. Once a person reaches a certain point, it’s all over. We are patient and forgiving for a while, but then eventually we just can’t stand it anymore, and that relationship is crushed like a Tootsie Pop. When our boss treats us unfairly, we turn in our key and hit the door. When friends hurt us, we push them out of our lives and seek revenge. When children disappoint, we turn our backs as if we never cared. When our spouse betrays us, we pack our bags (or theirs) and file for divorce. Jesus’ response to Peter was to forgive seventy times seven. That’s a lot of forgiving! 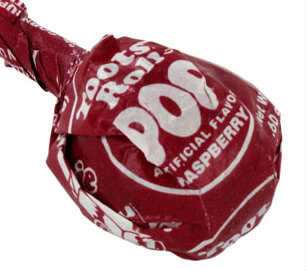 I remember often losing count while trying to get to the center of the Tootsie Pop. Even if I could have made it to the center without biting, I probably wouldn’t have been exactly sure how many licks it did take! I think that was Jesus’ point in telling us to forgive seventy times seven. It would be very difficult to keep up with that many offenses against us, so instead of tallying each offense we need to just “be kind and compassionate to one another, forgiving each other, just as in Christ God forgave you” (Ephesians 4:32). 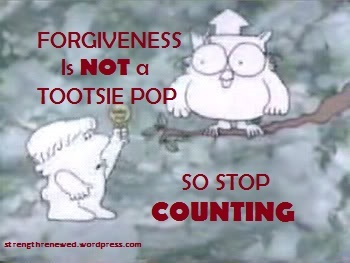 Remember, forgiveness is not a Tootsie Pop. Don’t even try to count the number of times you have forgiven someone. Just show them the same mercy that you have received. “Bear with each other and forgive whatever grievances you may have against one another. Forgive as the Lord forgave you” (Colossians 3:13). Thank you, Tresa, for reminding me that I can never out-forgive God. He has shown mercy upon me countless times! And she had the grace to be merciful and forgiving. “Yes, Dad, you were a fine father,” she said. Any hurts or unfair treatment I have received is paltry by comparison to what this dear woman endured. She’s my shining example of someone who stopped counting. Thresa, this is so good and so true!! !